Sensitivity analysis using Martinez method. Experiment for the generation of two independent samples. If True, design that will be generated contains elements for the evaluation of second order indices. This class is concerned with analyzing the influence the random vector has on a random variable which is being studied for uncertainty, by using the [Martinez2011] method for the evaluation of both first and total order indices. DrawSobolIndices(inputDescription, …) Draw the Sobol’ indices. getAggregatedFirstOrderIndices() Get the evaluation of aggregated first order Sobol indices. getAggregatedTotalOrderIndices() Get the evaluation of aggregated total order Sobol indices. getBootstrapSize() Get the number of bootstrap sampling size. getConfidenceLevel() Get the confidence interval level for confidence intervals. getFirstOrderIndices([marginalIndex]) Get first order Sobol indices. getFirstOrderIndicesDistribution() Get the distribution of the aggregated first order Sobol indices. getFirstOrderIndicesInterval() Get interval for the aggregated first order Sobol indices. getSecondOrderIndices([marginalIndex]) Get second order Sobol indices. getTotalOrderIndices([marginalIndex]) Get total order Sobol indices. getTotalOrderIndicesDistribution() Get the distribution of the aggregated total order Sobol indices. getTotalOrderIndicesInterval() Get interval for the aggregated total order Sobol indices. getUseAsymptoticDistribution() Select asymptotic or bootstrap confidence intervals. setBootstrapSize(bootstrapSize) Set the number of bootstrap sampling size. setConfidenceLevel(confidenceLevel) Set the confidence interval level for confidence intervals. setDesign(inputDesign, outputDesign, size) Sample accessor. setUseAsymptoticDistribution(…) Select asymptotic or bootstrap confidence intervals. Sequence containing the importance factors with a description for each component. The descriptions are used to build labels for the created Pie. If they are not mentioned, default labels will be used. Variables’ names used to build labels for the created Pie. A graph containing a Pie of the importance factors of the variables. A graph containing the aggregated first and total order indices. If number of bootstrap sampling is not 0, and confidence level associated > 0, the graph includes confidence interval plots in the first usage. Get the evaluation of aggregated first order Sobol indices. Sequence containing aggregated first order Sobol indices. Get the evaluation of aggregated total order Sobol indices. 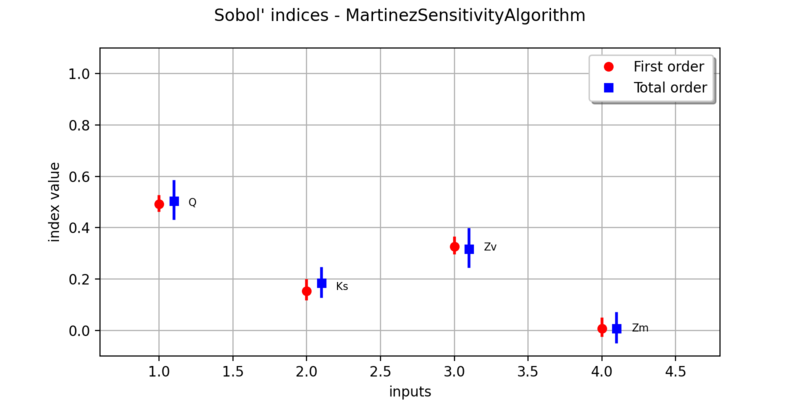 Sequence containing aggregated total order Sobol indices. Get the number of bootstrap sampling size. Get the confidence interval level for confidence intervals. Get first order Sobol indices. Index of the marginal of the function, equals to by default. Sequence containing first order Sobol indices. Get the distribution of the aggregated first order Sobol indices. Distribution for first order Sobol indices for each component. Get interval for the aggregated first order Sobol indices. 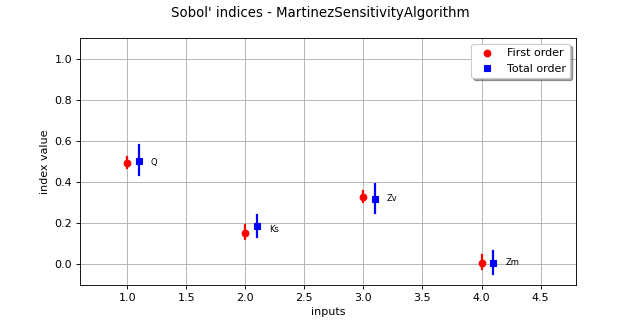 Interval for first order Sobol indices for each component. Computed marginal by marginal (not from the joint distribution). Get second order Sobol indices. Tensor containing second order Sobol indices. Get total order Sobol indices. Sequence containing total order Sobol indices. Get the distribution of the aggregated total order Sobol indices. Distribution for total order Sobol indices for each component. Get interval for the aggregated total order Sobol indices. Interval for total order Sobol indices for each component. Computed marginal by marginal (not from the joint distribution). Select asymptotic or bootstrap confidence intervals. Set the number of bootstrap sampling size. Set the confidence interval level for confidence intervals. Default value is set by the SobolIndicesAlgorithm-DefaultUseAsymptoticDistribution key.